Daniel has grown up in France since with 16-year-old brother Josh, who is on the French U-17 side, and 11-year-old Bobby who was born in Toulouse. Munster tried to sign Trevor Brennan's son Daniel last year when Rassie Erasmus was in charge but the young tighthead decided to remain in France to develop more as a player. 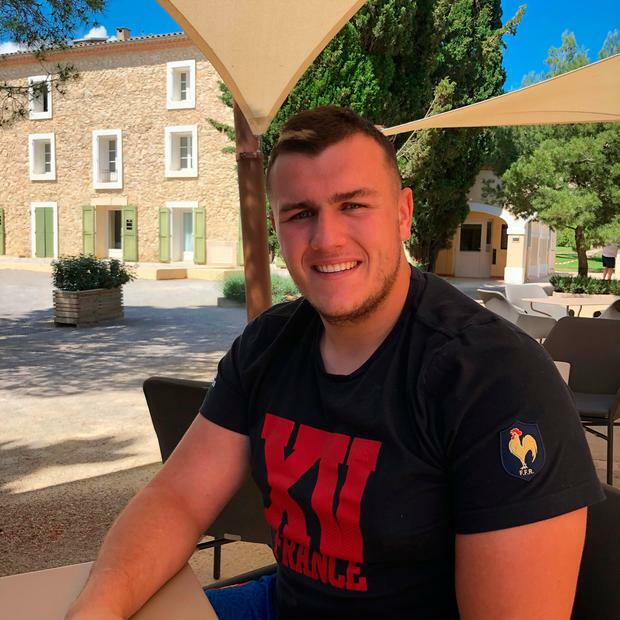 On Sunday, he will bid to become the first Irishman to win a World Rugby U-20 Championship medal but he will do so in the blue, white and red of France having moved to Toulouse when he was just three-and-a-half. The whole family moved to France when dad Trevor, having played for Leinster and won 13 Irish caps, was signed by Toulouse in 2002, going on to help them win the Heineken Cup twice. Daniel has grown up in France since with 16-year-old brother Josh, who is on the French U-17 side, and 11-year-old Bobby who was born in Toulouse. "I didn't go to an English school. They stuck me in the French school and I didn't know what they were talking about at the start. I ended up learning the French language. It's much easier when you are a kid to pick up a language. It was more difficult for my parents, Trevor and Paula. They speak fluent French now but they have these accents. "When I speak French you wouldn't know I was born in Ireland. It just came quite naturally. But people slag me for my Dublin accent, not least because I am supposed to be a Lilywhite! The whole family, my mum and dad, are all from Leixlip but I have a Dublin accent when I speak English," said Daniel, speaking at Domaine de l'Hospitalet, the vineyard ten kilometres outside Narbonne where the French squad are based for the World Rugby U-20 Championship. Brennan holds and Irish passport and makes regular trips home and a year ago gave serious consideration to making a permanent move back when Munster came calling. "I had a chat with Rassie Erasmus last year. I just said it's not my time to leave France yet. I had the U-20s this year. I had that noted on my notebook, I wanted to make the U-20s. I played with them in Georgia last summer but it wasn't my year and I wanted to be here when France hosted it. "There was a little chat at the start of the year, (with) Johann van Graan. But I signed pretty early with Montpellier, in January. I just wanted to get it over and done with. I had the Six Nations coming up," added Brennan, who will move to Montpellier after signing a three-year deal. "I think I can still play for Ireland. I have always played rugby in France. I am born in Ireland. I am obviously really proud to be Irish. I love my Irish origins. I love where I come from. I love going home meeting everybody. But I also love being French. French rugby has been so good to me." Dad Trevor, who has sold his renowned pub De Danu in the city and who has opened Brennan's Bar in Castelginest, has never interfered. "He would leave me to myself. But now I find when I'm doing well that's when he is annoying! 'Dan stop eating sh**e, Dan get up and go for a run.' Giving me tips, but he wouldn't put any pressure on me."